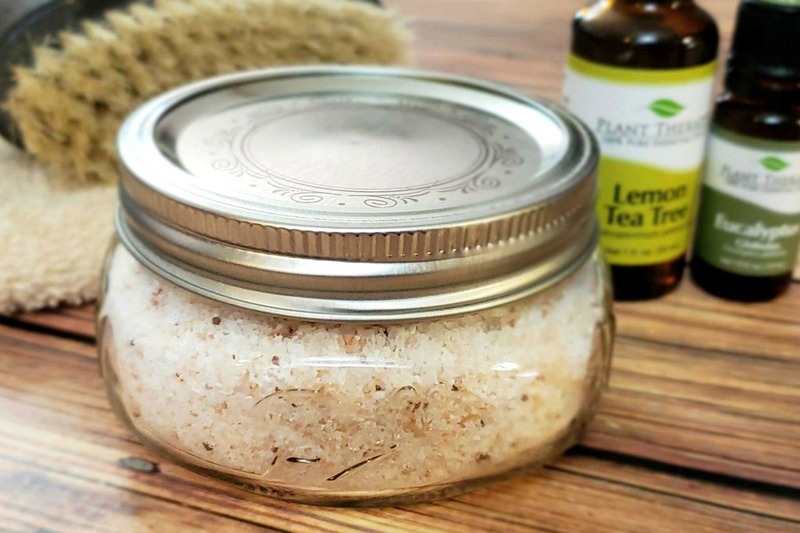 Fizzy bath salts are one of my new favorite homemade beauty products. They’re so easy to make – you get the benefits of bath bombs without all the effort! This Lemon Tea Tree Eucalyptus scent is perfect for winter months and seasonal allergies. There’s nothing like a long, hot bath to relax and rejuvenate in, especially during the cold winter months. I don’t know about you, but my sinuses always act up this time of year. I like to use natural methods to help keep my sinuses clear. 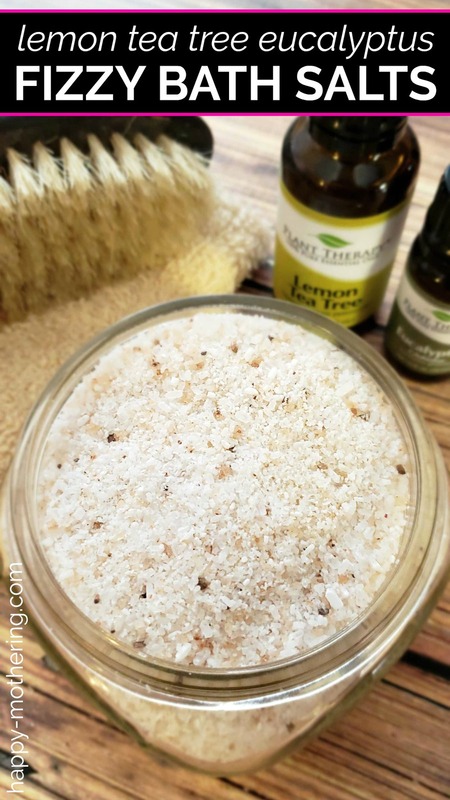 These Lemon Tea Tree Eucalyptus Fizzy Bath Salts do a great job of opening them right up. The citric acid causes an effervescent effect. The bubbling helps draw the aromatic benefits of the lemon tea tree and eucalyptus essential oils into the air. Eucalyptus essential oil is known for supporting the respiratory system and lemon tea tree oil is very cleansing. Together, they’re a great combination for the winter months. I got the Lemon Tea Tree oil as part of Plant Therapy’s Oil of the Month Club. I found it to be a really fun way to explore new essential oils! 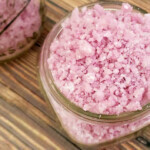 You could use all Epsom salt and leave out the Himalayan sea salt if you don’t have it, but that’s what gives these fizzy bath salts their pretty speckled pink color. It’s also really great for providing your skin with minerals during the bath. So gather your supplies and let’s get to work. When you’re done, you can draw yourself a bath and sit back, relax and enjoy the experience. Add the essential oil drops, working them evenly into the salt mixture. Transfer to an 8-ounce mason jar for storage. Add 1/2 cup of fizzing bath salts to your bath for an aromatic experience. Be sure to rinse off in the shower after bathing. 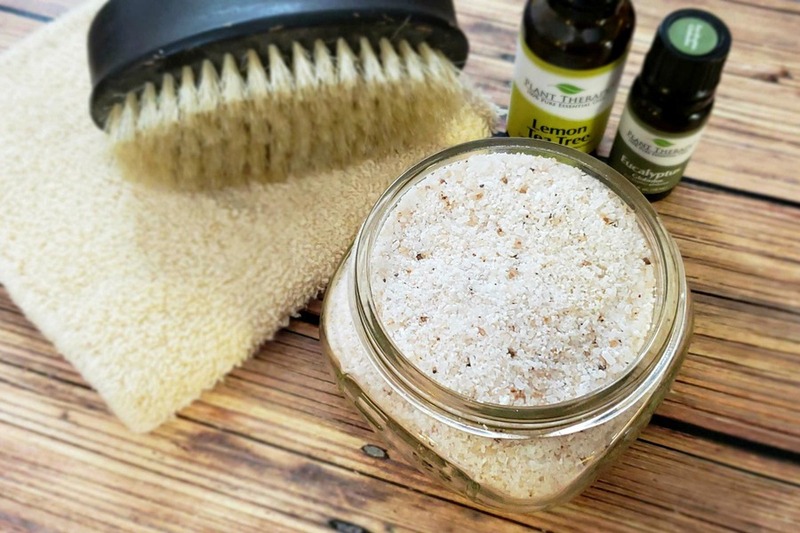 What other essential oils do you like to add to your fizzy bath salts? 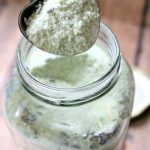 More DIY Bath Salt Recipes to Try! Thank you for sharing this recipe. It is Christmas tradition that we make bath salts each year, my daughter and I. This will be a nice addition to the recipes for my upcoming blog! No worries! I will get with you for linkback and rights later! I really does – great for winter! I love the scent of eucalyptus – it helps keep my sinuses clear.